YEAH BABY! PR in a Christmas tree costume! I don’t run too many 10Ks so I didn’t have an overly ambitious time to beat, but not gonna lie…I was kinda nervous about publicly making the dumb goal to run fast in this outfit. It was flopping around and choking me for most of the race, but the crowd support helped me manage a PR of 42:54. Nothing beats the feeling of sprinting passed an intense runner and seeing their look of shock when they realize they’re being past by a Christmas tree. Cecilia filmed the finish. Check out the video here! I feel incredibly light and free now that I am wearing normal clothes again. 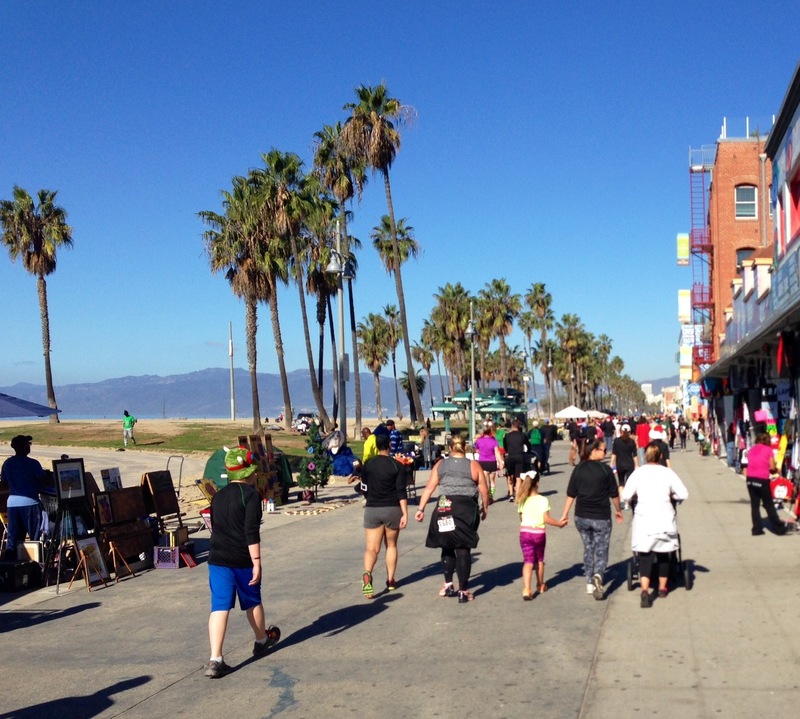 This is my fourth time running this 10K/5K combo race, and it is STILL my FAVORITE race of the year. 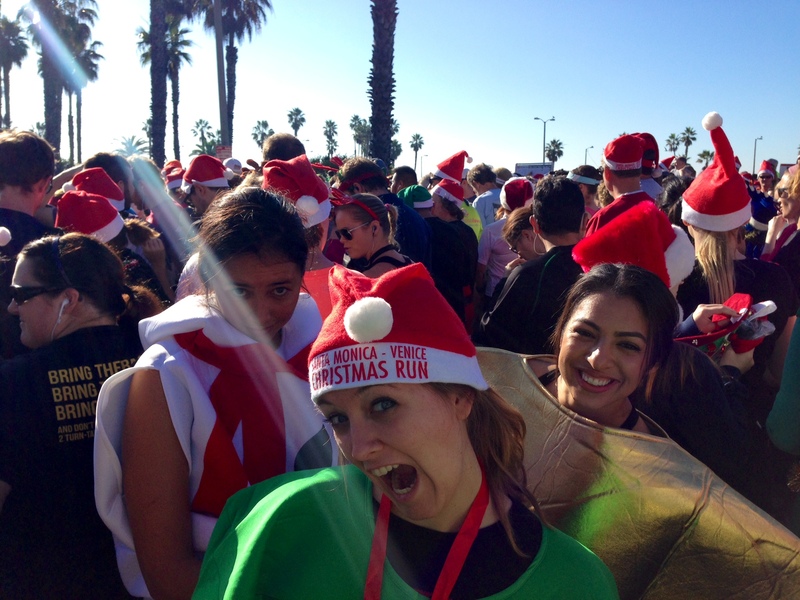 Alaina (aka Ernie) is my official Santa-Monica Venice Christmas Run Buddy. We’ll be old ladies running this race. Last year it was pouring rain, but this year we were (maybe unfortunately due to our costumes) gifted with warm weather and sunshine. So many runners were out today! I saw people from RunMDR, Back on My Feet, Lululemon. It was awesome to see so many people out having a good time! Every year I run the 10K first, then walk/run the 5K. Our group is growing. This year we had Archana, Cecilia, Marta and Joe join in on the fun! 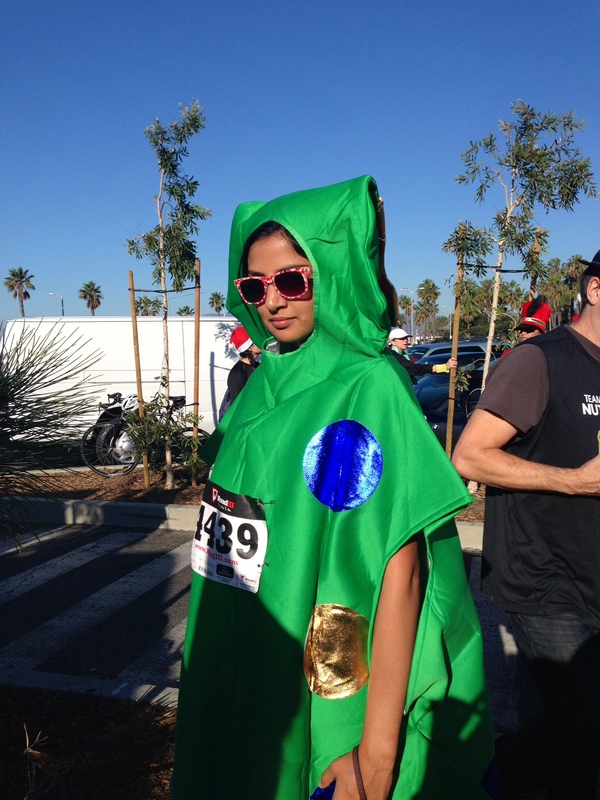 For the 5K our finish consisted of Archana and I (the Christmas trees) twirling around in circles while the rest of our team danced around us singing “Rocking around the Christmas Tree.” It was amazing. I need to run more races in costume. Archana is one hot mama! We got really lucky with the freebies this year. Nutribullet was making smoothies, and after the 5K when they were packing up and getting ready to leave, they had TONS of produce left over. We all got bananas, spinach, strawberries and blueberries. Yay for free groceries! 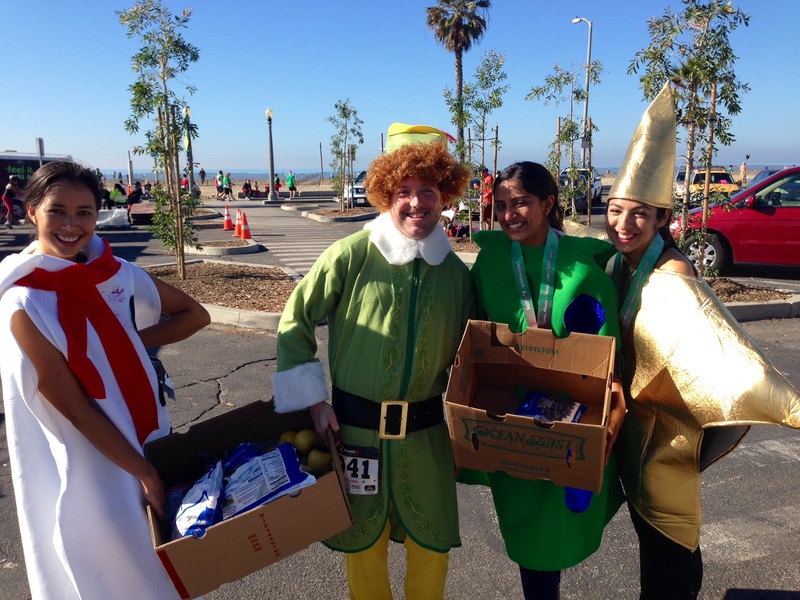 Opal apples at the finish! Turns are kinda annoying in the 10K if you are really trying to go fast. But it’s fun to see other runners so I think it’s worth it! NOTHING ELSE. IT IS SOOO MUCH FUN! 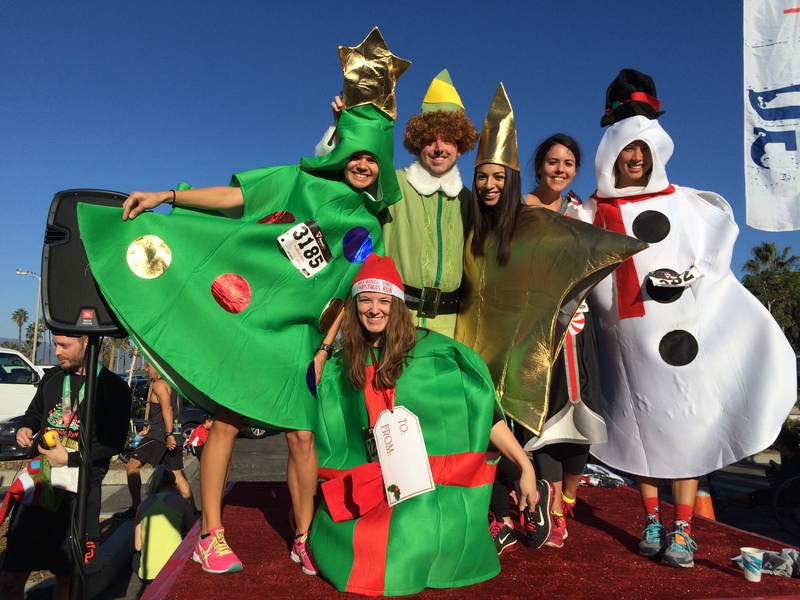 This entry was posted in Race Review and tagged 10k, costume running, race, santa-monica venice christmas run. Bookmark the permalink. SO. MUCH. FUN! I’m so happy we run this race every year. It is the best!